Running an errand or concierge business is a perfect home business for those who wants to work at home, but not tied at home. It is a business where there is no routine, and each day typically brings in different tasks and challenges. Vehicle = you will be constantly on-the-go, so you will need a car or bike if you are in the city. Be sure to check with your insurance agent as well as know the tax implications of using your personal vehicle for business purposes. Concierge business management software to help you track of client information, time charged to the client, reporting tools, automated billing and invoicing, among others. You can start an errand or concierge business for as low as $1,000-$5,000, especially if you limit your overhead costs and spend only on the essentials. For example, consider starting first as a sole proprietorship instead of as a corporation to minimize business formation fees. You may want to hold off hiring employees until you have enough clients in your belt to help pay for the additional costs of hiring another person. The potential income from the errand and concierge business depends on your target market as well as services provided. It is also highly dependent on the state of the economy: when the economy goes down, even the rich can feel the pinch and start reducing expenses such as concierge services. It can also be highly seasonal, depending on your target market and services. 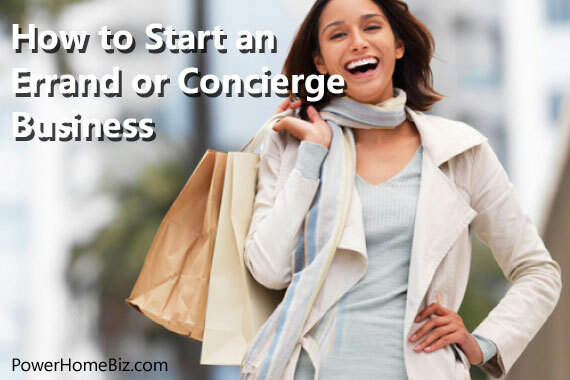 Hourly rates for startup concierge business can be anywhere between $35-70 per hour. Some maternity concierge service providers charge as much as $75-$115 an hour. The higher the income of your target clientele, the higher you can charge for your hourly rates. It is important to determine the number of billable hours you can work in a week. This will help you get a firmer understanding of the potential income of your business. There will be tasks that you will be doing from home, while others in your clients’ homes and others require you to go out. Note that there will be tasks that you need to do that will not be billable, such as meeting potential clients, marketing, and bookkeeping, among others. This will help you determine whether there is a need to hire flexible employees that can work for you only if you have billable time to give to them. To calculate your potential income, assume that you are charging by hourly rates and that your rate is $50 per hour working on 40 billable hours per week. You can potentially earn gross income of $2,000 per week or $8,000 per month. You can increase your income by increasing your rate, increasing billable hours, or hiring employees. Set up monthly memberships where clients purchase a chunk of time on a monthly basis. You can set up different levels of memberships and pricing, depending on the services that you will provide. For example, a $25 a month membership gets customers five requests, and $75 a month allows them to make requests for 25 tasks. You can develop and sell bundled service packages where clients purchase a specific list of tasks that will be done for them for specific periods of time. This is an approach commonly used by highly-targeted concierge businesses such as maternity service providers and luxury travel organizers. To help ensure retention and continued business from your existing clients, offer retainer agreements. This will give you and your clients a written agreement wherein you provide a set amount of hours or number of tasks that will be done for them every month for a year. An errand or concierge business is a perfect home business for those who wants to work at home, but not tied at home. Learn the startup costs and income potential of an errand and concierge business.